vacuuming can become seriously traumatic. When your dog exhibits these actions, they are letting you know that they feel whatever is occurring, is potentially dangerous, threatening or painful. These signs should not be ignored. Extreme fear can lead to desperate escape attempts, urination or even biting. Fortunately, there are things you can do to correct such behaviors in dogs. 1. The most likely cause of shyness is insufficient social contact with people during the first weeks of life. Dogs look to their owners to be the "alpha dog" of their "pack" and to guide them safely into new and stimulating situations. Without these experiences, the dog may become timid and skittish when introduced to things outside their immediate familiarity. 3. Dogs that have been abused or have experienced traumatic events often become extremely fearful. 4. There is also a good chance that your dog never really learned how to socialize properly in the first place. If this is the case, you should be able to use some very effective dog behavior training techniques to fix this issue in no time. Centuries of breeding dictate dog behaviors. Do you want a dog that herds your cats into the corner, or would you prefer one who fetches them gently to you when required? Below is a chart that will help you determine if your pet is sociable by breed. To avoid unnecessary fears or anxieties in the future, make sure your puppy is exposed to an assortment of new people, places and situations. This gives them the foundation for how to appropriately behave in these situations throughout the rest of their life. If you have a shy dog who reacts fearfully to everyday situations, you can take a few steps to help him become more confident. Don’t comfort your dog for being afraid. 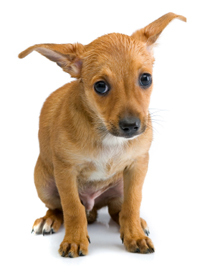 Coddling your dog will only reinforce and reward your dog’s shy behavior. When you exhibit confidence, you show your dog there is nothing to be afraid of. Forcing your dog to greet others often only exacerbates the problem, causing the dog to want to avoid the people and situations more than before. Incrementally expose your dog to the object or situation he or she fears. 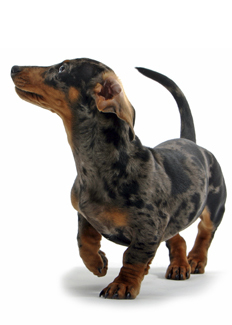 Increase the stimulation gradually so that your dog will eventually not find the object or situation life-threatening. Give your dog opportunities to be successful at remaining calm during stressful situations to help your dog build his or her confidence. The key is to reward your dog for remaining calm. Some dogs may be so anxious and overcome with fear that they are unresponsive to behavioral modification or desensitization. 1. Have a friend the dog is unfamiliar with stand a few feet away from the dog. 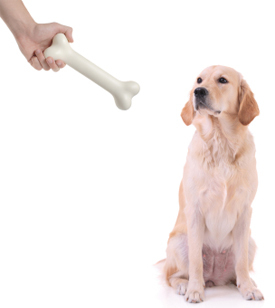 Have them toss a treat or one of your dog’s toys on the ground, then walk away. Repeat the process, with the person closer to the dog each time. Your dog should learn to associate positive things with strangers rather than negative things. 2. Use a toy every time you greet your dog after you have been away. The dog should eventually associate the toy with pleasant interaction. Once that has happened, you can use it when your dog is meeting strangers. Give it to visitors when they enter the house or take it with you on walks when you meet strangers along the way. The Key: The more people a dog makes friends with, the more able it will become to cope with the new people he/she meets. Obedience training: You may need to get the help of a professional trainer or behaviorist, depending on the extent of your dog’s fearful or anxious behaviors.